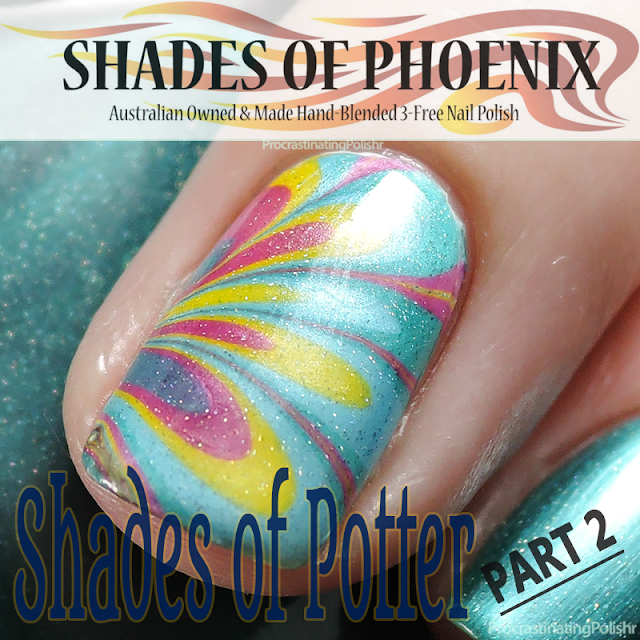 I can never go for too long without mention of Harry Potter, so today I've got some swatches of the recent additions to the Shades of Phoenix 'Shades of Potter' collection. Back in May Teneil released five gorgeous colours that were very autumn/winter appropriate, and this set of four are perfect spring/summer shades! My favourite part - they water marble amazingly well! 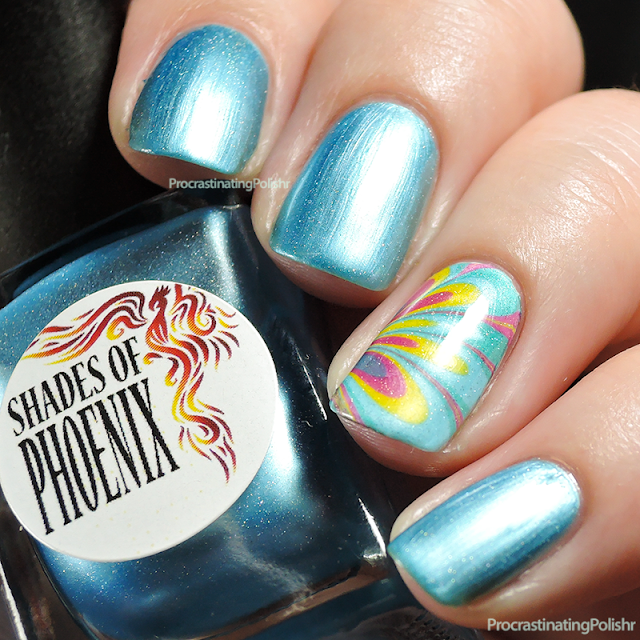 An icy sky blue with ultra fine scattered iridescent sparkle. It definitely has the eerie glow of the pensieve where Dumbledore stores his most important memories. I was most excited about this colour out of the four newbies but I was a little sad that it took four coats for full opacity on me. Others have found it only needs three so it may depend on how thin your coats are - I usually go for quite thin coats. I still love the colour and it pays off well in the water marble so yay for that! "Bottled good fortune. Brewed correctly the drinker of this potion will be lucky in all their endeavours, but be warned… excessive consumption is highly toxic and can cause extreme recklessness." 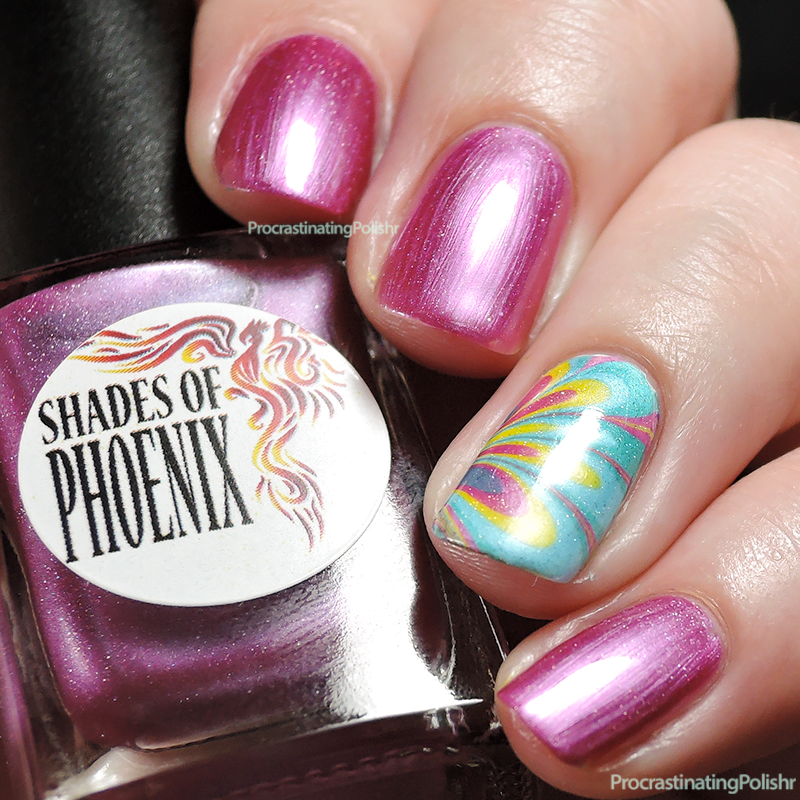 Liquid Luck for your nails! 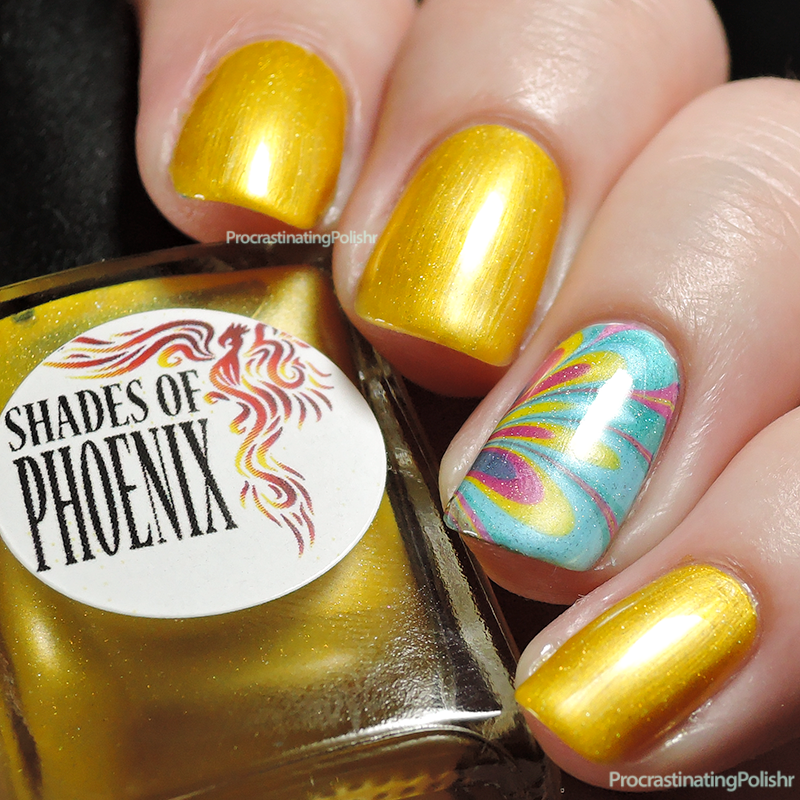 Either luck or talent is required to create a good yellow polish and I think in this case it's talent - it's the third yellow from Shades of Phoenix this year, all of which are brilliant. This one is inspired by the Felix Felicis potion, a molten gold liquid that gives the drinker good luck for a period of time. Whether this polish can give you good luck is yet to be proven, but the sunshine yellow and iridescent sparkle at least make you feel like you're on top of the world! I needed three thin coats for this, and it dried far smoother than than photo appears - the brushstrokes weren't that noticeable on the nail. Ah yes, that trademark Dolores Umbridge charm! She really has such a way with words. Wait. No. Not that charm, perhaps a certain locket you mean? Umbridge is evil personified! But she does love pink, and this polish is definitely pink! I'd say it's a dark, slightly dusty rose hue with the strongest metallic finish of the four. 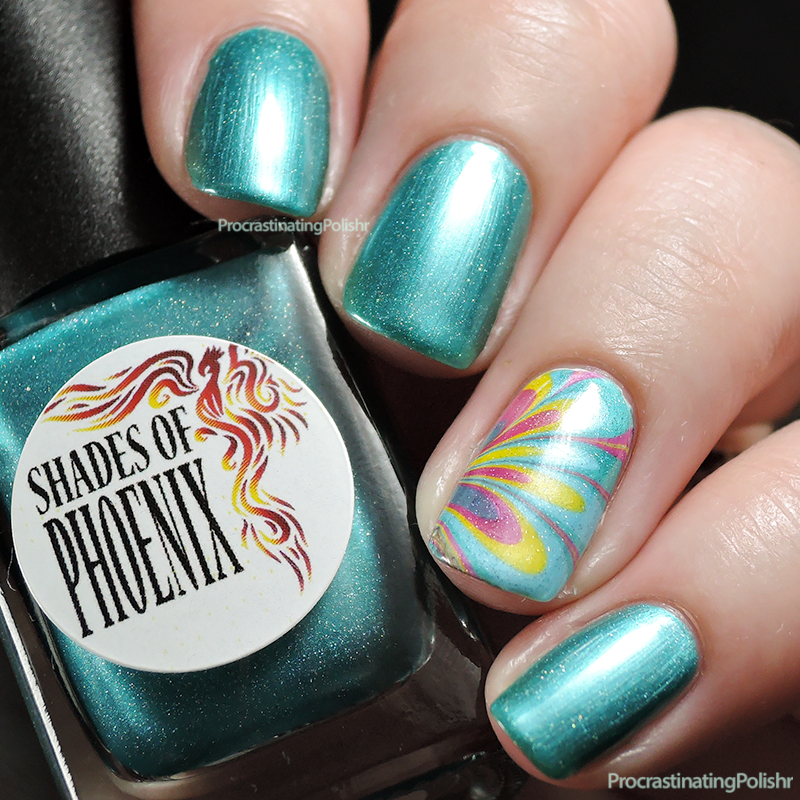 This one only needed two coats and has a beautiful consistency but it was the most brushstrokey on the nail. The colour payoff is sensational though, and look at how it pops in that water marble! "Only one known person has ever survived it, and he's sitting right in front of me." Oh Voldy, you might be the big bad he-who-must-not-be-named, but your little Avada Kedavra curse just couldn't kill Harry Potter could it? I love a bit of green and this teal beauty is a definite winner for me. Again just two coats required, and like Felix's Luck it has a very smooth finish - I swear the only fine detail my camera ever picks up is brushstrokes! Keep up to date with releases, sales and more from Shades of Phoenix on Facebook and Instagram, or join the Shades of Phoenix fan group on Facebook.